Watching Gravity, I often felt like I was witnessing the future of filmmaking; director Alfonso Cuarón’s space thriller represents a joint achievement of technology and artistry that is nearly unprecedented. It’s at turns thrilling and terrifying, and there are long stretches when it’s impossible to tear your eyes from the screen. And yet, in some significant ways, it fails – not due to a lack of craft but because it doesn’t have enough faith in the simple drama of its story of survival. From there, nothing gets easier for our astronauts – it appears that Murphy’s Law applies in space, as well – who must now find another suitable vessel to return home before their oxygen runs out. Their journey is never boring, not for a second, but it becomes increasingly, distractingly instructive: Cuarón is in total control of his audience, pulling our strings through his stunning visuals and deafening musical score. How much you enjoy the film may depend on your level of tolerance for being manipulated. Still, amidst the controlled chaos, there are opportunities to stop and consider the metaphorical implications of the story. 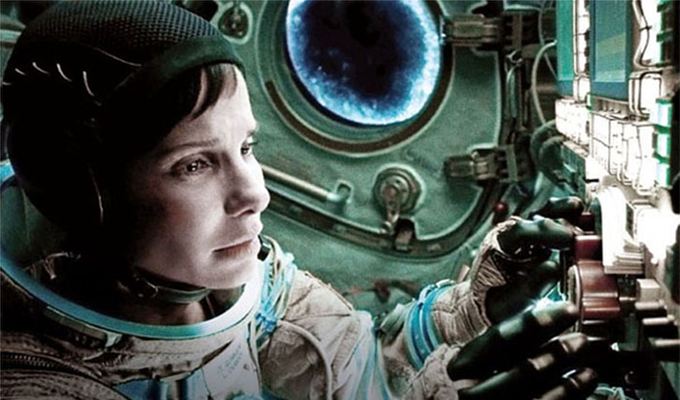 Cuarón has obviously thought a lot about our relationship to outer space, how we are simultaneously drawn to its quiet beauty and terrified by the isolation. Gravity is at its most interesting when this dichotomy lingers in the subtext – or in Bullock’s tensely locked face. Unfortunately, these themes dominate the film’s second half, which is driven more by symbolism than story. As Ryan struggles to return to Earth in an escape pod, the film frames hers as a journey of rebirth from personal trauma, which Cuarón uses heavy-handed birth imagery to represent (those ropes that connect astronauts to the ship start to feel a lot like umbilical cords). Focusing on Ryan’s emotional journey at the expense of the story itself is a significant misstep that the film never quite recovers from. I could hardly believe it, but in the final sequence that determines Ryan’s fate, I found myself actually not caring. To put it another way, Gravity could have taken a note or two from Apollo 13, a gripping space survival story that avoided poetic musings and, much like its hero, kept its gaze squarely on the task at hand. In some ways, it’s not a fair comparison, since Apollo 13 was based on a true story, and Gravity isn’t. Apollo 13 painted a reverent portrait of real-world heroism. Gravity aims for slightly higher art. But Cuarón draws the comparison himself by casting Ed Harris in the same role he played in Apollo: the astronauts’ NASA contact on the ground. These flaws should not dissuade anyone from seeing Gravity. It’s a monumental achievement that might be the most awe-inspiring movie of the year. But there’s a simple lesson that, of all people, the creative team behind the film should have taken to heart: in storytelling and in life, it’s important to keep your feet on the ground, even if your head is in the clouds. NOTE: Rating Gravity provides a challenge for this critic. The film is not good enough to earn a top rating, but it also demands to be seen on the biggest screen possible and certainly in 3D. That’s why, despite its significant problems, you should probably See it in the Theater.